Nowadays the Rotonda is included within the broaden architectural complex of Villa Aldini, a characteristic mansion built by the Napoleonic minister, Antonio Aldini, in one of the most visible locations of bologna, the so called hill of San Benedetto, close to Porta San Mamolo. The construction of the manor begun in 1811 thanks to a project of the architect Giuseppe Nadi. However only five years later Villa Aldini was abandoned due to the defeat of the Napoleonic empire. The little Romanic rotunda would have been the function of a cosy space for music concerts or dining room. A legend tells that the Rotonda was built after a divine signal. In 1116, Picciola, Alberto Galluzzi’ daughter and Ottaviano Piatesi’s widow, decided to erect a church in the hill of San Benedetto. During the construction works, a white dove begun to transport many little wisps of straw and pieces of wood creating a big circle. The episode was seen as a good omen wanted by the Divine Providence. As consequence Picciola obeyed to the heavenly sign and she modified the previous project, giving to the church a circular floor plan. In fact, the Rotonda is perfectly round, oriented following the cardinal points. 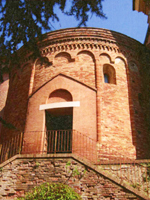 Despite of the legend, the church would date at the XIIth century, when all over the hills of Bologna many other religious monuments were edified as the Eremo di Ronzano or Santa Maria del Monte della Guardia. Nowadays visitors can still admire some wall paintings with the image of the Holy Marie and the twelve apostles dated from the second part of the XIIth century. They represent a rare and precious testimony of the bolognaise Romanic art.